Greece, also known as the Hellenic Republic, is a Southern European country with a population of approximately 11 million people. The historical home of Western civilization, Greece played a huge part in the development of modern society, politics, and education, being the birthplace of Western philosophy and literature, as well as the home of countless influential mathematicians and scientists. With one of the richest histories of any countries in the world, Greece continues to play a key role in modern times, being a founding member of the United Nations and the biggest economic power in the Balkan region. 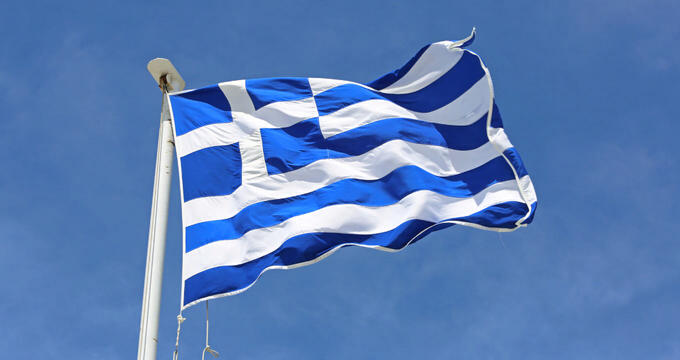 One of the symbols of Greece is its flag. Nicknamed 'I Galanolefki' and 'I Kyanolefki', which translate to 'The Blue and White' and 'The Azure and White', respectively, the Greek flag is immediately recognizable with its bold blue/white color scheme. Like many European nations, the territory the world now knows as modern day Greece has held many flags over the years. During the Byzantine Empire years and Ottoman periods, for example, dozens of different flag designs were used. Most of them had no real resemblance to the modern Greek flag, but some did at least feature the same blue and white two-tone color scheme, as well as the famous Greek cross which has been a symbol of the Orthodox Catholic Church for many centuries. Eventually, in 1822, at the First Greek National Assembly, it was decided that Greece needed to move on from its old revolutionary flags and select a flag to represent the entire nation. Three flags were designed, one for use on land, one for use abroad, and one as a merchant flag. The design chosen for use abroad was the design we known in the modern era, and in the years that followed, this flag was eventually chosen as the sole national flag of the nation of Greece, becoming the one and only official Greek flag in 1978. The Greek flag is made up a white cross on a blue background in the top left corner, with nine horizontal stripes, alternating between blue and white, making up the rest of the design. The symbolism of the cross is clear and defined as a primary symbol of the Eastern Orthodox branch of Christianity for many centuries, but the interpretations of the stripes and colors have varied over the years. Some people believe that the nine stripes represent the nine syllables of the phrase "Eleftheria i thanatos", which translates in English as "Freedom or Death" and is actually the national motto of Greece. Others argue that the stripes were chosen to represent the nine letters of the Greek word for "Freedom", which also ties in with the national motto. Some historians, meanwhile, argue that the symbolism of the stripes represents the Muses, the goddesses of literature, art, and science in ancient Greek mythology. As for the colors, there are also various ideas and theories to explain the selection of blue and white. Some believe that they represent the sky and the sea, with the Mediterranean Sea playing a big part in the history of Greece and the nation being well known for having one of the longest coastlines of any nation in the world. Others argue that the choice of colors was inspired by famous figures in Greek history and mythology. Alexander the Great, for instance, used the colors on his army banners, with the legendary Achilles also being associated with blue and white. The Byzantine Empire was also said to have used the colors regularly, but there's no general consensus on exactly why these two colors were chosen for the Greek flag, and the mystery may remain unsolved forever. Greek law carefully controls use and displays of the Greek flag so as not to bring it into disrepute or dishonor. For example, the flag may be flown at many different locations, from the Presidential Palace to public schools, but must always be placed on a white mast with a white cross at the top of it. The Greek flag cannot be damaged in any way, and if it does get torn or ripped, it should be burned respectfully rather than kept. Nobody is allowed to write on the flag or cover it up with additional symbols or images, and the Greek flag cannot be used by businesses or for any commercial use. It cannot be hung from windows as it always needs to be attached to a mast, but can be displayed at sporting events or other gatherings.